Registration for trip leaders only, no payment required. Join GLS for a spectacular and relaxing member's only weekend camping on the northern California coast just south of the town of Mendocino. 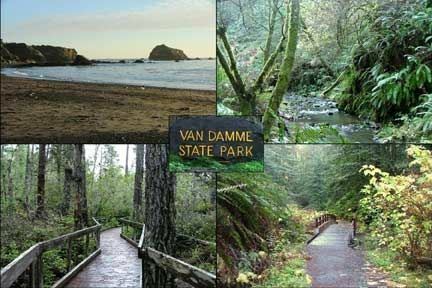 Van Damme State Park brings together the drama of the rugged Mendocino coastline and the relaxing beauty of forest. There is plenty to explore right there including giant ferns, old growth Redwood, and a 100 year old Pygmy Forest as well as beaches, coastal bluffs and wetlands farther inland. For the action oriented there is hiking and ocean kayaking. For the birders, there are Yellow warblers, belted kingfishers, Swainson’s thrush and northern spotted owls among others. All right there, without getting in your car! Farther afield is everything your heart could desire including rivers, restaurants, famously picturesque towns and endless amounts of coast.